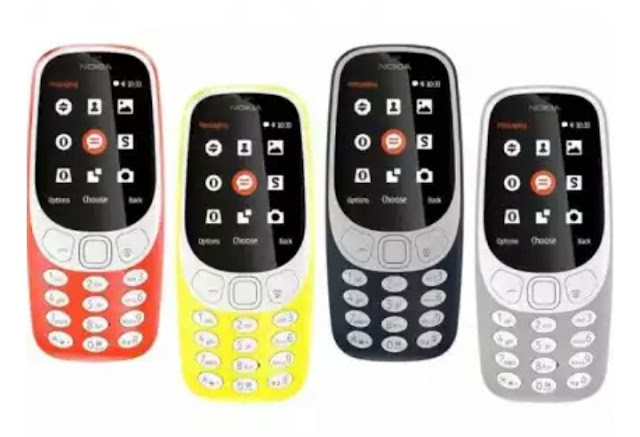 New improved NOKIA 3310 mobile phone has arrived again to hit the market this month of May. The New and improved Nokia 3310 is set to hit market in worldwide from this month of May 24, 2017. Nokia has improved a new stylish designed phone 3310, which is set to roll the market this month of May. All fans of Nokia have been excited since February when parent company Nokia consortium has announced that the iconic phone would be making a comeback. Nokia consortium said in a press release: “Thin, light and incredibly durable, the Nokia 3310 is a head-turning modern twist on one of the best-selling feature phones of all time. The new improved NOKIA 3310 will also feature the legendary built-in game, Snake, as an homage to the original device. The new phone 3310 features a battery capable of lasting up to a month, limited 2.5G internet connection and a two-megapixel camera. The New Nokia's 3310 in exclusive design look fresh, colourful with modern designed that brings it bang up to date. This Nokia 3310 is also available in four distinctive colours – warm red and yellow, both with a gloss furnish, and dark blue, black and grey, both with a colourful designs. There's something the old original Nokia 3310 didn't included but this all New improved comes with 2-mega pixel CAMERA snapper which includes a LED flash light. This product Nokia 3310 is well known when its comes to battery life. Anyone who has ever owned a smartphone will know the pain of battery but Nokia 3310 fixes this problem. Nokia is boasting that this new improved feature phone can last for a whole month on a single battery charge. The new improved Nokia mobile phone featured to be boastfully use up to 22-hours talk-time and mouth-long standby. - MP3 playback up to 51.0 hours. Anyone who has use Nokia 3310 before will know that its best known when it comes to durabilty. The original Nokia 3310 was fame to be what someone used and throw away if possible, but remembered it was stronger and more longer in use. This new device is thought to be more tougher to withstand being dropped on the floor. Some of the retailer has already be hurried in taking pre-orders for the products. But Nokia has reportedly asked has people to stopped taking pre-orders for some of these product Nokia 3, Nokia 5 and Nokia 3310 (2017), probably due to the fear of unable to fufill the orders or thought of managing the demand and supply. The revamped of new improved version of Nokia 3310, might be to take the attention of the smartphones users but the factor seems to have help outweigh the negative. Today, as all flagship phones continue to get more costly and expensive in the market, one can have much alternative to get good cheapest long battery and durable phone, and you can still keep change for more other material.